Ever-changing and always interesting, trends often inform the way we present ourselves to the world, and this includes the design of our homes, particularly our kitchens. The kitchen trends of 2018 have been talked about in print, in person and online, and we’re adding our voices to the crowd to detail what the must-have features are in your kitchen in 2018. Always on trend, always reliable and always attractive, natural stone worktops are the perfect addition to any kitchen. Granite, quartz and marble provide sleek, clean looks with various idiosyncrasies that make each piece unique to the other. Neolith surfaces offer immense durability combined with beautiful design, with brushed and polished finishes available to suit your tastes. 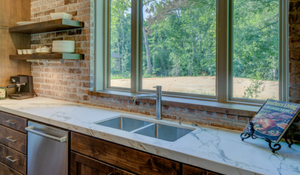 Whether you’d like white marble counters or dark grey granite surfaces, there’s a natural stone worktop for you and they suit every kind of kitchen design. Bold is better, according to tastemakers and designers, so it’s time to give your kitchen that summer revamp with colours that make a statement. From bright panelling and cupboardry to colour clashes, certain spaces will benefit from brighter schemes. For example, colourful designs for cooking areas can add to the light, airy feel, whereas subtler hues can help provide a nice backdrop for socialising and conversation. If the colourful trend sounds like something you’d be interested in, you can opt for either dashes of colour in certain parts of the kitchen, or full-blown colour bursts that dominate the room. The choice is yours! Disguising or hiding your lighting is a tried and trusted method of illuminating a room whilst maintaining an almost-ethereal sense of invisible light. Consider using strips of LED lighting on the undersides of eye-level cupboards – this will help illuminate counters for cooking and cleaning, offering a more localised alternative the main ceiling lights in the room. Trough sinks are sleek, stylish and versatile. Far from just a means of washing your pots and pans, they can be used as storage for items that you don’t necessarily want to hide away: champagne, wine, ice or even herbs can be kept in these troughs, and they provide a dash of positive disruption to the uniform nature of a kitchen surface. 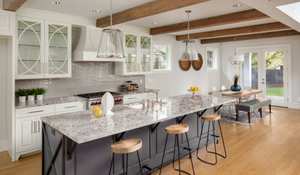 Those are just five of the many trends that homeowners can take inspiration from for their 2018 kitchen look. Whatever you choose to do, giving your kitchen a new lease of life can make a huge difference to your home. 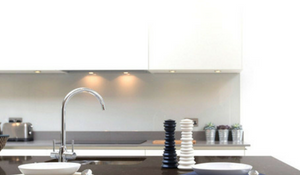 Touchstone Worktops are experts in the supply and installation of granite, quartz and natural stone worktops, supplying commercial and domestic customers with the finest quality products around. For more information, please get in touch with us today and we’ll be more than happy to help.